Good job getting the questions! I'm going to look at them very carefully when checking out which ones I think might be the Mole. Thanks, flynn! I just got my issue of EW, but sadly, no Mole ad! I heard on TWOP that it was in randomly selected magazines in this May 30th issue (Usher on the cover), and that it is very easy to find in the issue. The ad is in a hard piece of paper between the magazine. Anyone know what the "message from The Mole" is? I'm curious! Jon Kelley hosts the fifth season of the reality competition, which kicks off with the 12 cast members meeting in Los Angeles, Chile, and jumping over the edge of a waterfall. One of the contestants ends up stranded alone on a deserted beach. "I lie with my eyes"
Either the message is a clue to how The Mole will lie and sabotage the games, or it's a cryptic message. I think I may look at the contestant's bios for any clues. Please do share your opinions. It's always interesting to hear everyones thoughts and I have read some incredible theories so it's always welcomed by me. I have to admit I am sooo looking forward for the show to begin. You can also text "themole" to 22288 for mobile alerts and clues. I understand that you will receive 1-2 messages a week and can stop at any time. I couldn't find anything in their bios. I would keep that clue in the back of your mind for when you watch the show, it may be a 2-part hidden clue. This is now the thread to discuss all the hidden (and sometimes not so hidden ) clues in. We will be analyzing and dissecting all those clues right here from week to week, so everybody stay alert and point out any that you see! This thread WILL become somewhat spoiler-y as the season goes on and all the clues begin to point towards our MOLE. So if you really want to see if you can discover the clues all by yourself, and/or remain totally unsuspecting about the clues, then this may not be the thread for you. But if you are like me and really want to investigate all the "clues" and discuss was that a clue? or wasn't it? And was that a sabotage move--or wasn't it? Then you are in the right place! This is where we will be keeping track of all those clues! But this is also the NOT the place for any real "outside" spoilers about who the Mole can or cannot be--so do NOT post any spoilers that are not clue related here. The first mobile clue for Episode 1 reads: "NIC@IT"
Craig is the only person on the ABC website that is wearing glasses in his profile. Regarding the "NIC@IT" clue, Craig is a Graphic Designer (hence the IT). I think the NIC refers to Nicole, but I have no idea what connections that has to do with it. Question 6: What is The Mole's age? Question 7: In "Over The Falls," what was the outcome of The Mole's jump? Question 8: Did The Mole drive one of the vans to the beach? Question 9: At the start of the "Crusoe" mission, was The Mole wearing a hat? After a four-year absence, The Mole returns to ABC Monday night (10 pm/ET) where contestants complete a grueling series of physical and mental missions. This is ultimate teamwork: the missions have to be completed together in order to build up cash amounts that are eventually won by the winner. But beware the Mole — a saboteur and one of the 12 contestants whose mission it is to prevent the group from winning the cash. All the while, the players try to figure out which one of them is the Mole through a series of quizzes. At the end of each episode, the players are quizzed about the person they think is the mole (example: on the first night, where was the Mole assigned to sleep?) Score the lowest, and you face "execution." The player who survives all the executions over ten weeks wins the cash that has been accumulated by the group — up to $500,000. "This is like a mystery. A Whodunit," says executive producer Clay Newbill. "The list of clues players must find is like something out of a mystery novel." Former Extra host Jon Kelley hosts this season's series of mysteries. Wanna know who's the Mole? Don't ask him. "I have no idea," he says. "And that's the way I like it. It allows me to play along. Sometimes I think I'm absolutely sure of who it is and then it blows up in my face." 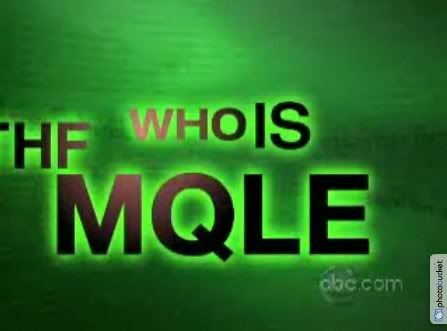 After two seasons of Celebrity Mole in 2003 and 2004 (before the franchise took a four-year hiatus from TV), the series is back with civilian contestants. Newbill says advanced technology has allowed a more high-tech and entertaining presentation. "I like to call this 'Bionic Mole' — bigger, stronger, faster." Contestants this season are dropped off in Los Angeles, Chile (yes, you read that right) and among the missions is to scale a huge waterfall. Unlike Survivor, where contestants eat whatever they can find and sleep outside, players on The Mole have had the luxury of staying in high-class hotels. There will be less of that this season. Says Newbill: "While there is still some of that glamour of hotels and fine wine, the missions sometimes call for the contestants to be out all night in sub-freezing temperatures. Like traveling through the Andes. Or having to scale the Salto Del Laja Falls [on Monday's premiere]. It's not easy for them." It takes a little more than just being smarter than the average bear to have a shot at winning. "In the past, we've had contestants who were doctors and lawyers," Newbill says. "Those are occupations that require a lot of book smarts. That won't necessarily help you on The Mole. You must be very perceptive and have a very good sense of strategy. You've got to have good gut instinct and be able to adapt to different situations." Also, this year, the show has a very strong online presence allowing viewers to play along as if they were on the show. "People can take the same quiz online as the contestants on the show," says Kelley. "Plus, there will be three or four clues on the web site pointing them to the identity of the Mole." Looking forward to the first episode and trying to figure out the clues! I think the clues will gradually accumulate so thought I would start a running tally of them all here, and add to it here as we go? Please let me know if I miss any! And part of the fun of the Mole is...is it a clue---or not?? I think that's eleven. The host guy held up journal #11, so I'm thinking that might be a clue. Hi guys! Come talk about the show over here too if you want in the episode thread? When they were all getting their journals, they were reaching into a box for them. Maybe the #11 journal was used just as an example? I agree with the letter thing, however. LVN is something to look at during the course of the show. Notice how each letter corresponds to a name of one of the contestants, and only one contestant has this initial. This people are Liz, Victoria, and Nicole. Strange coincidence if this Triple E clue is in fact spelling "Eleven".